(AFP) - Investigators recovered a body from the wreckage of a plane carrying Argentine footballer Emiliano Sala in the Channel and transported it to Britain on Thursday for identification. Britain's Air Accidents Investigation Branch (AAIB) also said that bad weather meant they were not able to recover the plane and it was therefore closing down the operation. The light aircraft was carrying the 28-year-old footballer to his new Premier League team Cardiff City when it disappeared near the British island of Guernsey on January 21, along with 59-year-old pilot David Ibbotson. 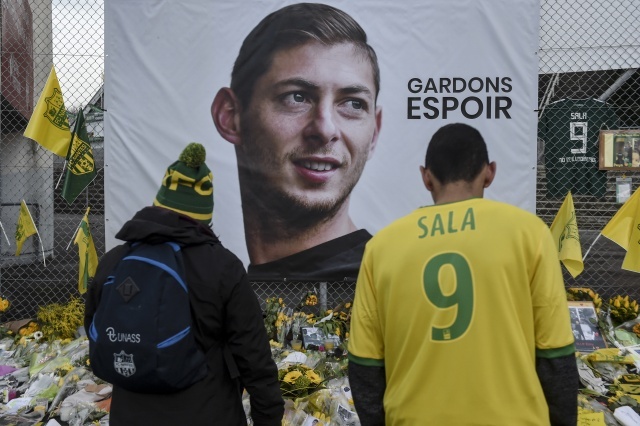 Sala's disappearance prompted outpourings of grief across the footballing world, including at his former club Nantes in France where the plane was flying from. After search operations were suspended, a shipwreck hunter hired by Sala's family with funds donated by football stars such as Lionel Messi found the wreckage on Sunday. The AAIB, who then took over the operation, revealed on Monday that an unidentified body had been found at the site. "In challenging conditions, the AAIB and its specialist contractors successfully recovered the body previously seen amidst the wreckage," the AAIB said Wednesday. "The operation was carried out in as dignified a way as possible and the families were kept informed of progress." But it added: "The weather forecast is poor for the foreseeable future and so the difficult decision was taken to bring the overall operation to a close". It said that extensive video footage captured by a remotely operated vehicle is expected to "provide valuable evidence for our safety investigation," adding that it intends to publish an interim report on the accident later this month. The recovered body was taken to the Isle of Portland in southern England on board the Geo Ocean III offshore supply ship and will be now be passed to the coroner in the county of Dorset for identification. Sala was flying to join up with Cardiff City in what was the most expensive signing in the Welsh club's history. Nantes have consulted lawyers to explore legal options to ensure Cardiff pay the transfer fee for Sala, a source close to the French club revealed on Wednesday. According to the source, the first instalment of the 17-million-euro ($19.3 million) deal for the Argentine striker has yet to be paid, despite the transfer being finalised before the accident. Nantes would also consider taking the case to FIFA, the source added. The club has not yet responded to a request for comment by AFP. According to BBC Wales, Nantes have given Cardiff a 10-day ultimatum over the first payment of between five and six million euros. A source at Cardiff told British media that the Welsh club will honour the contract but only once they have clarified "all the facts". Cardiff are said to be "surprised" with the timing of the demand so soon after the tragedy. The plane, a Piper PA-46 Malibu, vanished from radar around 20 kilometres (12 miles) north of Guernsey, with pilot Ibbotson the only other person aboard. After the official rescue team gave up their search, saying there was little chance of finding anyone alive, Sala's family raised more than 370,000 euros ($422,000) in an online campaign to pay for a private hunt. "Had that not happened, I don't think anybody would have searched for the plane," shipwreck hunter David Mearns, whose private company found the plane, told AFP. The discovery of two seat cushions on the French coast last week revealed that the plane was broken, Mearns added. Earlier this week Sala's father, Horacio Sala, acknowledged that there was no prospect of finding his son alive. "There's no longer any hope," he told Fox Sports. "We hope the two bodies are inside (the plane). It's over, the only thing I hope now is that they find them."